How is your vision? Are you seeing things clearly? Even if you have perfect vision, there may be a whole world out there you are missing. When I was a Mormon, I met a man named Charles Roesel. This man put his arm around me and said these words I will never forget. He said, “God loves you. One day I am going to baptize you and you’re going to join my church because I am going to be praying for you to get saved. Not only that… God is going to use you in ways you can’t even think or imagine right now.” How is that for vision? Charles had a vision for me before I could have one for myself. He used to make me so angry when he said things like that to me–yet every word of his vision came true. Does your vision come from God, or is it something you dreamed up yourself? God has a perfect plan for your life, but you can miss out on some of it if you don’t have a clear vision. Your heart is the largest factor that will determine how great your vision is. Jesus often spoke in parables to his audience. A parable is like the skin of the Florida orange that keeps the flavor protected for the diligent, but keeps its delight from the lazy. Jesus explained to the disciples when they questioned him about it. “…I speak to them in parables; because while seeing they do not see, and while hearing they do not hear, nor do they understand. In their case the prophecy of Isaiah is being fulfilled, which says, YOU WILL KEEP ON HEARING, BUT WILL NOT UNDERSTAND; YOU WILL KEEP ON SEEING, BUT WILL NOT PERCEIVE; FOR THE HEART OF THIS PEOPLE HAS BECOME DULL, WITH THEIR EARS THEY SCARCELY HEAR, AND THEY HAVE CLOSED THEIR EYES, OTHERWISE THEY WOULD SEE WITH THEIR EYES, HEAR WITH THEIR EARS, AND UNDERSTAND WITH THEIR HEART AND RETURN, AND I WOULD HEAL THEM.’ But blessed are your eyes, because they see; and your ears, because they hear. I know many people have vision for the future. They operate businesses, invest for the future, and make diligent plans enabled by their vision. If you have plans for the future that don’t include God’s plan for you, then you do not have eyes to see. There is a vast difference between earthly vision and godly vision. Do you have vision for others in your life or do you just want to survive? Do you desire to prepare for the eternal future or just the temporal future? 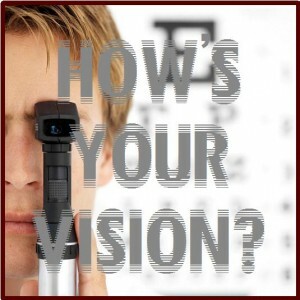 God has given us a “corrective lens” to improve our vision. The Bible is a light that gives direction for those who are willing to seek, but it is simply a distraction of life to the lazy who will not open it for the sweet delight inside. So we have the prophetic word made more sure, to which you do well to pay attention as to a lamp shining in a dark place, until the day dawns and the morning star arises in your hearts. But know this first of all, that no prophecy of Scripture is a matter of one’s own interpretation, for no prophecy was ever made by an act of human will, but men moved by the Holy Spirit spoke from God.